A beautiful ladies bike shirt with a spray design in aqua and other shades of blue. This cycling shirt is based on a previously successful susy cycling shirt. This new cycling shirt has a spray design. The colors of the spray design are various shades of aqua and blue. 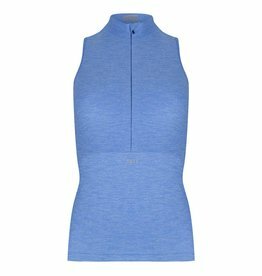 Aqua and blue are easy to combine with other ladies cycling wear or a Susy ladies bike shorts. The spray design is irregular and gives a playful effect to the beautiful cycling shirt. The front of the beautiful ladies bike shirt has a nice, sturdy block zipper. The ykk zipper is extremely smooth and forms to the body. The zipper is in a contrasting color. The back of the zipper is nicely finished so that the zipper will not irritate while cycling. The zipper is 25 cm long. The back has a retro band with stripes in aqua and blue. This elastic band can be found in the entire Susy collection. The band has a beautiful retro look and two silicone stripes so that the bike shirt stays in place and during a bike ride. Both the front and the back contain a blue Susy logo. This logo is reflective in the twilight and provides extra visibility. All seams on the inside of the beautiful ladies bike shirt are made with soft nylon yarns. So the ladies cycling shirt is extra comfortable and feels like a second skin during cycling or mountainbiking. This beautiful ladies' shirt has three back pockets and a zippered pocket. The zippered pocket is placed in the side seam and has a YKK zipper. A beautiful ladies bike shirt with a durable spray print. The ladies bike shirt is digitally printed. This is a sustainable way of printing because only the patterns are printed. Which means there is no loss of dyestuff. The spray printing of the beautiful ladies bike shirt takes place in Poland. They use high-quality dyestuff so the cycling shirt remains beautiful after frequent washing. How do you keep the Susy ladies bike shirt as beautiful as possible? Do not iron the cycling jersey. The technical yarns are not resistant to the high temperatures of the iron. Best you can hang the beautiful ladies bike shirt after washing on a clothing hanger. The fabric comes from Italy.